Tunis, Tunisia – The Arab League has rejected the US’s recognition of Israeli sovereignty over the occupied Golan Heights and renewed a call for the establishment of a Palestinian state, saying peace and security in the region depended on a solution to the decades-long Israeli-Palestinian conflict. In a final statement after Sunday’s summit in Tunisia’s capital, Arab leaders stressed their “full support for Syria’s right” over the Golan plateau, which Israel seized from Syria in the 1967 war, and expressed their determination to “continue efforts to resume” peace negotiations between Israel and Palestine. The daylong meeting in Tunis took place against the backdrop of ongoing regional unrest and conflict – from the long-running wars in Syria and Yemen to instability in Libya, and the widespread anti-government protests in Algeria and Sudan to a major diplomatic dispute in the Gulf. Khamis al-Jihnaoui, Tunisia’s foreign minister, who delivered the 30th summit’s final statement, called the continuing conflicts in the Arab world “unacceptable”. “Arab reconciliation is the starting point for stability in the region,” he said. But his statement did not make mention of the majority of conflicts plaguing the region. Instead it was Washington’s recent move over Golan Heights and the Palestine issue that took centre stage. Jihnaoui, reiterating the “the centrality of the Palestinian cause”, said Arab leaders were committed to resolving the conflict based on the Arab Peace Initiative of 2002, which offered to recognise Israel in return for a full withdrawal from lands occupied in the 1967 war, including the Golan Heights, East Jerusalem and the West Bank. Speaking earlier in the day, King Salman bin Abdulaziz Al Saud of Saudi Arabia repeated his kingdom’s support for a Palestinian state with East Jerusalem as its capital, while King Abdullah of Jordan, the custodian of Jerusalem’s holy sites, promised he would continue to protect the al-Aqsa Mosque compound. For his part, Abdel Fattah el-Sisi, Egypt‘s president, called for a “comprehensive peaceful solution” in order to “put an end to this painful era, which wasted our energy for seven decades”. Mahmoud Abbas, the president of the Palestinian Authority (PA), meanwhile, blamed the US for the continued Israeli occupation. “Israel’s continuation of its racist policy, and the act of being a state above the law, would not have been possible without the support of the American administration,” Abbas said at the summit. The PA has rejected the US as a mediator between Israel and Palestine since US President Donald Trump recognised Jerusalem as Israel’s capital in late 2017. But despite denouncing the US’s moves favouring Israel, there was no announcement of further action by the Arab leaders. The summit’s focus on Palestine, analysts said, was a fig leaf for Arab leaders to deflect attention from turmoil in their countries. Mahjoob Zweiri, the director of the Gulf Studies Center at Qatar University, described the meeting as an attempt by Arab leaders to “deny what is happening in the Arab world, such as the increase of corruption, lack of transparency, and the worsening economic situation”. In a move that ignores the Arab Peace Initiative, Arab states such as Oman and the United Arab Emirates over the past year have, overtly and covertly, tried to normalise relations with Israel. That is why, Zweiri said, the Arab League’s policy statement was nothing more than rhetorical posturing. Mouin Rabbani, co-editor of Jadaliyya, an Arab studies magazine, said the Palestine issue has been on the agenda of the Arab League from its very inception in the mid-1940s. However, in recent years it has been demoted to “secondary or even tertiary status”, he added. “Given that so many of today’s Arab governments are effectively beholden to foreign powers rather than their own citizens, there is now an attempt by the Trump administration to ostensibly rewrite international consensus on the resolutions of the question of Palestine – and for that matter the Arab-Israeli conflict – and using its enormous power to do so unilaterally,” Rabbani told Al Jazeera. “Over the past year, there have been consistent reports that the Trump administration has been doing so either with the cooperation with or with the acquiescence of key Arab states,” he said, referring to the Middle East peace plan process. The plan, which was devised by Trump’s son-in-law and senior adviser Jared Kushner, has the backing of major Arab states such as Saudi Arabia and Egypt. Its details have not been made public. 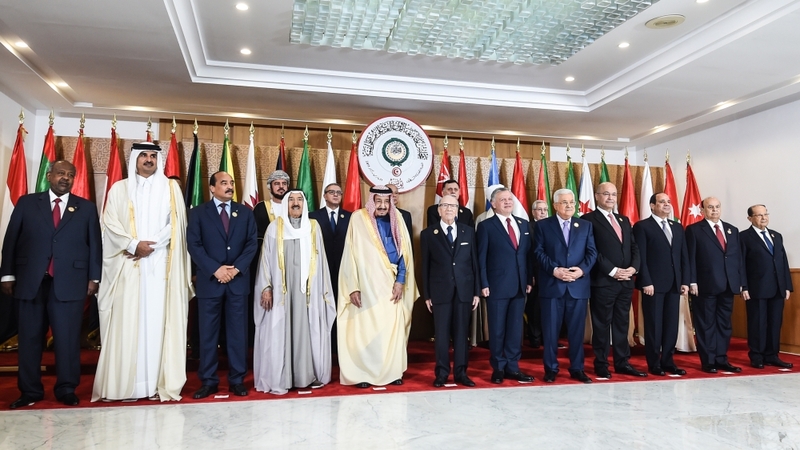 Given the keenness of Arab states’ to maintain good relations with the US, Rabbani said the Tunis summit was merely a “prominent platform” where leaders could deny accusations of their collaboration with Washington at the expense of the Palestinian cause. “The Arab League has conclusively and unambiguously demonstrated itself to be an obstacle to rather than an instrument of collective Arab action and promoter of Arab rights,” Rabbani said.